This site is composed of extracts from Rex Gilroy’s Books: Giants from the Dreamtime - The Yowie in Myth & Reality [copyright (c) 2001 & THE YOWIE"
Copyright (c) 2001 Rex Gilroy. 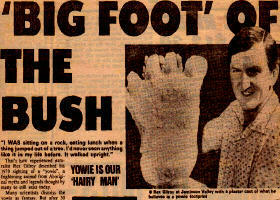 “Giants From the Dreamtime” -The Yowie in Myth and Reality. Copyright (c) 2001 Rex Gilroy, Uru Publications. Since 'Mysterious Australia  was written Ideas and Theories have changed.
" 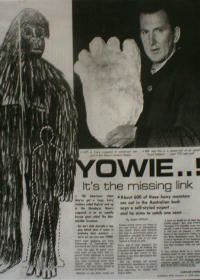 Giants From The Dreamtime - The Yowie in Myth & Reality." If it should surprise you that sober Australians are seeing creatures that have always been believed to be confined to the vast, snowy recesses and peaks of the Himalayas, then hold on to your armchair because by the time you've finished reading this chapter you could be convinced, as I am, that similar manlike monsters exist right here in Australia! You will learn that the so-called "Abominable Snowman" has been seen over a wide area of Australia from the earliest times of Aboriginal and then European settlement to the present day. As I have said, Abominable Snowmen are by no means confined to the Himalayas. Reported sightings of similar man-beasts have been recorded from both mainland and South-East Asia, and also over a wide area of North America. The creatures are known under a variety of names. Throughout the Himalayas they are known to the Sherpa people as "Yeti" ("dweller among the rocks"). In China, the "Chi-Chi or "Chang Mi ("wild man"); in Russia, the "Almastis" or "Chuchuna" ("hairy man of the forest"); and in Canada and the United States, "Sasquatch", ("hairy man of the woods", better known as "Bigfoot"). Other hairy man-apes are said to inhabit the jungles of South-East Asia and New Guinea. Further south still, in south-eastern Australia, the Aborigines preserve traditions of the "Yowie" (also known as "Doolagahl", meaning "great hairy man). The yowies, like their overseas cousins, are described as often enormous, hairy, manlike or ape-like creatures of tremendous weight and strength. Their physical description, as given by the Aborigines to early European settlers last century, also matches descriptions given by modem-day eyewitnesses, and I believe this will be significant in the eventual scientific classification of these creatures. According to the Aborigines, the yowies were terrifying to look upon: While most 'respectable' scientists dismiss the surviving 'relict hominid' theory out of hand, there are a number of other researchers worldwide who think otherwise. Of these, eminent American anthropologist Dr drover T. Krantz [Has since passed away. R.I.P.] of Washington State University is best known. From exhaustive studies and comparisons of what he considers to be authentic Bigfoot footprint plaster-casts, Krantz has concluded that the creatures may indeed be living representatives of Gigantopithecus. Despite widespread scientific opinion that Gigantopithecus would have walked on its knuckles like a gorilla rather than on its feet, Dr Krantz makes a convincing argument, based on the spread of its lower jaw, that Gigantopithecus was actually an erect biped. Using the massive fossil jaws of these monster man-apes as a guide, he says: If you change a gorilla to a vertical posture like a human, and make the neck come straight down, one thing you have to do is spread the back of its lower jaw to make room for the neck. And, as can be shown, the lower jaw of Gigantopithecus spreads much more widely than the jaw of a gorilla. Gigantopithecus was so much like the Sasquatch that I would assume Gigantopithecus is alive today." During the last great ice age, sea levels were much lower than they are today, and land-bridges joined Australia and the Americas to the Asian mainland. It was over these 'bridges' that the ancestors of the Yowie/Yeti/Bigfoot would have migrated. 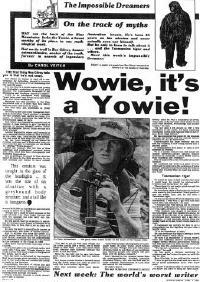 Our early European settlers took the existence of the yowie/Doolagahl for granted, regarding them as some secretive race that inhabited the still largely unexplored interior of the continent, and the eastern Australian mountain ranges in particular. In fact, sightings of 'hairy men' by Europeans date back to the first years of settlement. 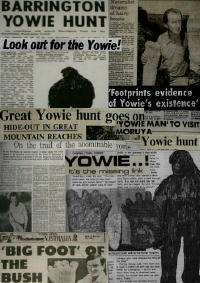 I find these 'historic' yowie reports fascinating, for they lend the mystery some degree of credibility. It is a belief in this credibility that has encouraged me over the past 36 years (as I am writing this chapter in 1993- now in 2009, over 50 years of Research) to undertake countless field expeditions, often into some of the most inhospitable mountain country, in search of evidence of these creatures' existence. 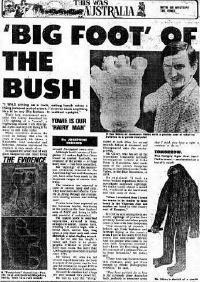 My first meeting with the yowie took place in 1957 when, as a 14-yearold student at Liverpool Boys High School in Sydney's west, I came across in the school library Aboriginal myths and legends books containing numerous tales of these hairy men. I immediately became fascinated with the creatures and began collecting all the myths and legends I could about them. 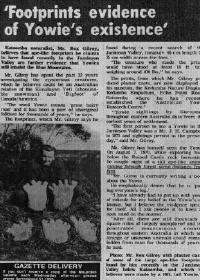 In 1958 when my family moved to Katoomba in the rugged Blue Mountains, not only did I soon find out that yowies were a part of local folklore, but that people had claimed to have seen the creatures from early last century into recent years. There are vague stories of early settlers and soldiers having seen and shot at hairy hominid creatures in the Springwood district of the lower Blue Mountains as far back as the 1820s. Over the years, similar tales have come from Katoomba and Blackheath as well as the nearby Megalong, Kanimbla and Hartley valleys. Even the Sydney district in its early years of settlement was the scene of numerous 'hairy man' sightings. Beyond the settlement of Sydney Cove in what are now the sprawling, populated suburbs of modern Sydney, vast forests of trees and scrub existed there at that time. As early as 1795, a group of settlers on a hunting trip was said to have spotted a man-sized hairy beast dashing away from them through the scrub. Aborigines claimed that hairy men inhabit the wild gullies in the Hornsby district north of Sydney, and in about 1822, settlers are said to have made the first sightings of the man-beasts. 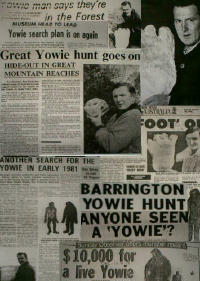 As the information concerning pioneer-period yowie sightings began to mount, so did my first modern-day reports. My first press interview brought forth a farmer who claimed his father had seen a taller-than-man sized, hairy, ape-like creature near their Oberon farm west of the Blue Mountains many years before. By the 1870s, coal and shale mining had begun in the Blue Mountains, and miners entered the rugged Jamieson Valley, cutting a railway line from the base of Katoomba Falls several kilometres out to the Ruined Castle rock formation where a settlement was established for the mining of its extensive kerosene shale deposits. It did not take long for the miners to become aware of the 'hairy man'. During 1875, a miner, Mr J. H. Campbell, was exploring scrubland on the western slope of the Castle, far below the tunnelling operations, when he sighted what he later described as a hairy, two-metre-tall, manlike ape-like animal moving through the scrub about 100 metres ahead of him, and seemingly oblivious to his presence. Mr Campbell picked up a strong piece of tree limb for protection and stalked the hairy creature for half a kilometre before it eluded him. Once settlers began penetrating further into Australia's vast interior, sightings of the hairy man began to mount. Sightings in the southern alpine region of Victoria-New South Wales date from around the 1850s, and in the northern NSW mountain ranges, such as on the Carrai Range west of Kempsey (to which we shall return), from the 1840s. In 1889 a cattleman, Mr Ben Delgate, with several other bushmen, was mustering stock in the Jindabyne district of the Snowy Mountains late one afternoon in May. As they moved the mob of cattle through timber on the banks of the Snowy River, their cattle dogs began acting strangely, sniffing the air then whimpering and barking at something somewhere off in the dense forest. Then Ben and his mates were startled to see a three-metre tall, hairy manlike creature emerge from the trees, brandishing a large tree limb which it began waving threateningly at the men while emitting loud snarls. The cattle began running in all directions, scattering in fright. One of the men raised his rifle at the man-beast and fired, hitting him in the shoulder. Screaming, the monster fled off into the timber, eluding the men who were unable to make their horses pursue the creature. The men could hear it screaming in the distance, crashing its way up through mountainside scrub. During 1895, two government geologists established a camp near Tumut while on a survey for minerals in the Snowy Mountains. Late one night prior to sleeping, the men saw something like a dingo moving around the outskirts of the camp, illuminated by the glow from the campfire. One of the men fired a shotgun at the 'thing', at which it adopted an upright stance upon two legs and scrambled into the bush. It was still emitting blood-curdling screams as it faded into the distance. The men stayed up all night, piling logs on the fire with guns at the ready in fear of the creature's return. The next morning they found tracks and traces of blood near the camp. This incident has parallels with another which took place a few years before World War 1 in the mountains behind Buggan Buggan. An Aboriginal couple, Big Charlie and his wife, were driving a wagonette through rugged bushland when they were suddenly attacked by what they described as a strong, manlike, hairy beast. Both escaped, but with a profusion of bleeding wounds.